supported by oil and gas stocks. Banking and NBFC stocks were the top drags today, followed by realty, IT and auto indices. Reliance Industries, HDFC-twins, Infosys, SBI, TCS and ICICI Bank were the top contributors to the Sensex’s fall. The domestic indices started on a negative note, plunging nearly 3% each to their six-month lows, tracking negative cues from the global markets. The Sensex plunged over a 1,000 points in opening trade, while the NSE Nifty tanked over 300 points, trading below the 10,200-level. SGX Nifty futures were trading over 250 points lower on the Singapore Exchange during early morning deals in today.IT major Tata Consultancy Services will be the first Nifty bluechip company to announce its corporate results for the second quarter ended September, 2018 today. Airline stocks traded higher today after the government on Wednesday cut excise duty on jet fuel or ATF to 11% from current 14% in a bid to give relief to the aviation industry that has been hit hard by high fuel prices. Most Asian currencies were driven lower by a global sell-off in equities with the dollar also surprisingly losing ground, while safe-havens like the Japanese yen and U.S. debt received support, said a Reuters report. The sinking rupee hit yet another record low in early trade on Thursday, but steadied to 74.390 by late morning. Currencies of export-focused economies such as South Korea's won and Taiwanese dollar fell the most against the greenback, down 0.9% and 0.5%, respectively. Singapore's dollar strengthened 0.1% to 1.382, ahead of a key policy meeting on Friday while also gaining support from a weaker greenback, the report added. 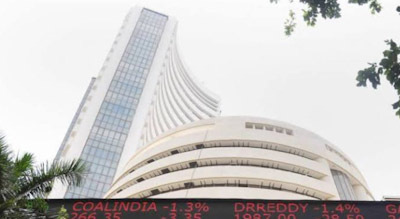 Global factors led to a 1000-point cut in the Sensex in opening trade today, which pushed the index below its crucial support at 34,000 while for the Nifty50, the cut was over 300 points. Overnight, US markets saw their worst decline in 8 months with rising Treasury yields and trade-related worries weakening risk appetite for equity investors... Most of the Asian markets are also in the same drop which weakness in US markets. Japan’s Nikkei sank 3.2 percent in early trading, which would be the biggest daily drop since March. The recent fall in rupee which pushed the currency below Rs 74/USD has made returns for foreign investors slightly unattractive. Also, it looks like a rotational trade is happening as money is moving from risk assets to risk-free assets." "India which was considered a relatively safe market a few weeks ago and now is fast losing its position after the INR plunged to a record low and crude oil prices soared to new highs. "Amid a sharp sell-off in the Indian equity markets on Thursday, nearly 216 securities hit their new 52-week lows. Andhra Bank, Bank of Baroda, Bharti Airtel Limited, BSE, Hindustan Aeronautics Limited were among the stocks which touched new 52-week lows during morning trade session. Oil and gas stocks were trading with marginal gains on Thursday despite a sell-off in the markets tracking falling crude oil prices. Oil prices fell to two-week lows as they extended big losses from the previous session amid a rout in global stock markets, with oil also taking a hit from an industry report showing U.S. crude inventories rose more than expected, said a Reuters report. ONGC was the only Sensex gainer, trading 0.30% higher. Central bank rate hikes were a "necessary development", International Monetary Fund chief Christine Lagarde said Thursday, a day after Donald Trump sent global markets tumbling by calling Fed increases "crazy", according to an AFP report said. "It is clearly a necessary development for those economies that are showing much improved growth, inflation that is picking up... unemployment that is extremely low," Lagarde told a press briefing at the IMF's annual meeting in Bali. "It's inevitable that central banks make the decisions that they make. "Trump's comments Wednesday triggered a sell-off on Wall Street, with Asian markets opening sharply lower on Thursday in response. "I think the Fed is making a mistake. It's so tight. I think the Fed has gone crazy," the US president said. Asian share markets sank in a sea of red on Thursday after Wall Street suffered its worst drubbing in eight months, a conflagration of wealth that could threaten business confidence and investment across the globe, said a Reuters report. MSCI's broadest index of Asia-Pacific shares outside Japan plummeted 3.9% to its lowest since March 2017. Japan's Nikkei fell 4.4%, the steepest daily drop since March, while the broader TOPIX lost around $230 billion in market value. Shanghai shares dropped 4.3%, on track for their worst day since February 2016, to their lowest level since late 2014, while China blue chips slid 4%. Shares in Taiwan were among the region's worst-hit, with the broader index losing 6.2%. "Global equities are facing serious declines, after Wall street suffered its worst fall since Feb this year. DOW closed down 831points, pressured by technology stocks fearing slow demand. European markets such as DAX too faced the onslaught, closing down 264points. Asian markets today morning are following the same negative trend with both Nikkei & HangSeng down by 1010 pts and 961 points respectively. SGX Nifty Fut following them is 267 points down. Yes, a carnage seen across the markets. Influencers like aggressive Fed rate hikes going ahead, IMF forecasted slowing global growth, trade tensions, ….are taking a toll on global equities. Japanese equities reacting more due to Yen-rise (as uncertainty and risk aversion makes the entry again). Chinese Yuan has depreciated to 6.94, and as mentioned earlier a break-off from 7.0 level can have serious impact on emerging currencies." "Other than Equity mayhem, which will be seen in domestic (onshore) market as well today, Rupee might be supported due to steep fall in Crude Prices (Brent at $ 81.55 per barrel), declining Dollar (Dollar Index at 95.24), and stabilising US bond yields. In all, harsh pounding of equities will be seen here today (compared to yesterday’s ‘recovery-day'), unless some actual visible measures are brought out by RBI/Govt machinery to counter the declines."